The Little House of Concrete Bookshelves: Alan Frost "Botany Bay: The Real Story"
Alan Frost "Botany Bay: The Real Story"
I have long suspected the conventional wisdom of the Australia in which I grew up and the condemnation of the so-called Black Armband historians in the recent History Wars spring from a common assumption there are things we would prefer not to know and, indeed, are better off not knowing. Growing up in the Anglophile Menzies era, there was a definite perception that Australia didn’t really have much of a history, at least not when compared to the historical glories of the British Empire, and what subsequently became the conventional wisdom regarding the decision that despatched the First Fleet was clear cut, the judge’s decision was final and no correspondence was to be entered into. As far back as the early 1950s, however, K. M. Dallas was suggesting Britain wanted a settlement to support an expansion of their interests in the Pacific and provide an alternative sea route to China. In this reading, it was the north Pacific fur trade, the development of sealing and whaling in the southern oceans and improved access to the China and South American trade that made the settlement of Australia viable. While there would appear to be evidence to support that hypothesis (whale and seal oil were in high demand in Britain, and five of the ships from the Third Fleet had been whalers and reverted to their original function after the voyage) this sort of suggestion ran counter to the standard narrative of hard times, surly convicts, unsuitable tools and failed harvests that lasted until some time around the start of Governor Macquarie’s relatively benevolent rule. Geoffrey Blainey's The Tyranny of Distance (1966) drew on Lord Sydney’s suggestion that the colony’s purpose was to be reciprocally beneficial, the only explanation given in official documents for the choice of such a remote location. In this reading, the benefit derived from a trade in flax, hemp, and timber for masts that would provide an alternative source for such materials should a blockade in the Danish straits cut off access to the regular sources on the shores of the Baltic Sea. A second, and secondary, benefit lay in the possibility that empty convict ships could carry cargoes of tea on the return voyage, and there is no doubt the security of trade routes to China were of major concern, given the fact that the regular route between India and China could easily be cut in the Sunda and Malacca Straits. From where I was sitting forty years ago all this made a great deal of sense, more sense, in fact, than the conventional wisdom that the American Revolution cut off the previous export destination for the criminal classes at the same time as changes associated with the Agrarian and Industrial Revolutions were adding vast numbers of petty offenders to the onshore jails and hulks moored in the estuaries. There was nowhere else to send those sentenced to transportation across the seas and Botany Bay was far enough away to ensure that those who’d been transported were unlikely to return once their sentence had been completed. After Dallas and Blainey others have questioned the conventional wisdom, and the questioning has produced a vigorous defence from the traditionalists. 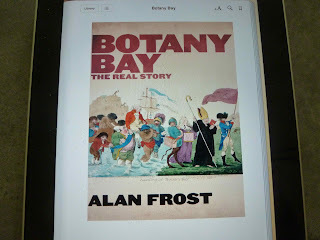 Frost's “real story" of the origins of Botany Bay draws on both sides of that debate, but does it by doing what someone should have done long ago and heading off to the primary sources, going beyond the obvious ones that fuelled the assumptions of previous generations of Australian historians. Thirty-five years of delving into the primary sources in Australia and overseas (most notably the Public Record Office, or National Archives, in London) has given Frost, emeritus professor of history at La Trobe University, the chance to build up an archive of 2500 documents, enough material to deliver a thorough analysis of the decision to establish a colony in New South Wales. Looking at the standard version of events the decision was based on the rising number of convicts who needed to be transported across the seas, so it makes sense for Frost to start by looking at crime and punishment in eighteenth-century England, tracing transportation back to the Tudor era, with convicts being sent abroad as early as 1597. They’d been used as a source of cheap labour in Africa, the Caribbean and India, and, after 1666, North America, the preferred destination until 1776. In Frost’s version of events most of those sentenced to transportation were definitely poor, were considered to be hardened criminals, or guilty of serious crimes of violence or robbery, and many were repeat offenders who would find a sentence of transportation for seven or fourteen years a better option than a date with the hangman. Having dealt with that one, Frost turns his attention to the build-up of criminals sentenced to transportation held on the allegedly overcrowded and unhealthy hulks in the Thames, Portsmouth and Plymouth, and suggests those run by contractor Duncan Campbell were, at least by contemporary standards, clean and well run, and not especially overcrowded (unlike the jails). The allocated rations were sufficient to keep most prisoners in reasonable health, death rates on board were not particularly high and a number of prisoners were pardoned by the crown on the condition that those pardoned would enlist in the armed forces to serve overseas. Still, when transportation to the American colonies ceased after the American Revolution those convicts needed to be sent somewhere and the conventional wisdom asserts Botany Bay was chosen because there was, effectively nowhere else. Frost looks at a number of schemes proposed to deal with the problem, including a scheme organized by a group of merchants whereby criminals sent to the African Gold Coast would be left to their own devices and, if they survived, become the core of a new colony. One does not need to be Einstein to figure out why that proposal didn’t get up. With Canada reluctant (based on prior experience), planters in British Honduras preferring African slaves to British convicts, West Indian slave traders reluctant to have their interests weakened by competition from English jails and plenty of cheap labour already on the ground in West Africa things would appear to be sliding towards the conventional wisdom. Frost, however, points out that apart from the colonies in the Americas and the trading ports on the west African coast, Britain's empire in the late 1780s mostly consisted of a series of trading depots in India, China and elsewhere, and those interests, being on the other side of the globe, needed to be looked after. A ship was sent to survey Das Voltas (Alexander) Bay on the present day between South Africa and Namibia, which would have provided a staging port on the route to the East, an alternative to the Dutch-controlled Capetown. That investigation found an unsuitable climate and an infertile hinterland, which brings us to the Matra proposal, put forward in August 1783 by James Matra, who had sailed on the Endeavour with Cook, and supported by the influential Sir Joseph Banks, who apparently campaigned actively against some other possibilities in the region, notably New Zealand. Banks apparently didn’t like the place. Matra’s proposal wasn’t, however, based on relocating convicts. He wanted somewhere to relocate those Americans (such as himself) who had remained loyal to Britain in the War of Independence, referring to good soil, the possibility of cultivating flax cultivation, the availability of timber for ships’ masts and spars as well as the possibility of trade with China, and it’s the question of flax and timber that, in Frost’s view, tilted the decision in Botany Bay’s favour. He goes into the political, strategic and logistical considerations behind those issues in some detail, exploring the complex political warfare, diplomatic struggles and commercial rivalries involving England, France, Holland and Spain, and makes it clear England saw itself as under threat from the French and Dutch, with the strong possibility that the next war would be over India. In that eventuality an alternative source for spars, masts and rigging would be useful, if not vital. In that light Botany Bay becomes more than a convenient or last resort (take your pick, it’s the same horse with a different jockey) avenue to remove some undesirables from the old country, it’s an opportunity to gain a strategic advantage over Britain’s continental rivals, assume control of strategic resources so sorely needed by the Royal Navy. But wait, there’s more. In Frost’s reading of the evidence, the settlement was part of an ambitious plan developed by Pitt the Younger and his advisers to expand British trade and acquire strategic bases in the Pacific and Indian oceans, promote a massive expansion of British trade with east Asia, the Spanish colonies in the Pacific coast of the Americas, the northwest Pacific coast and Kamchatka, survey coastlines and islands, create new bases along shipping routes, negotiate new trade agreements with China and, hopefully, Japan, and reduce or do away with the monopolies of the East India and South Sea Companies. And it doesn’t (or didn’t) stop there. According to Frost Botany Bay would provide a naval base and a port to repair and maintain ships, and deliver a pre-emptive claim on the territory Cook had named and claimed and, as well as supplying strategic naval resources would produce cotton, sugar and spices. The key document in all of this is the "Heads of a Plan" devised by Evan Nepean (Under-Secretary of the Home Office) in 1786, which amounted to a cabinet submission regarding the First Fleet venture, which offers, in its own way, support for both the traditionalist and revisionist arguments. It lists reasons for the proposal, including crowded disease-ridden jails and obtaining supplies of flax and timber found by Cook. Nepean’s first task was to come up with a rough estimate of the cost of sending a warship and a tender of about 200 tonnes and transports for 750 convicts, 200 marines, a handful of the civilian officials (a governor, lieutenant-governor, deputy judge-advocate, and others, including surgeons) and the stores that would keep them alive until they could feed themselves. Nepean worked from figures provided by Duncan Campbell (who had been in charge of the Hulks and would therefore know the expenses involved) and came up with a figure of £32 per annum, around £4 more than it would cost to hold him on a hulk in Britain. With that figure under his belt, the next task was to make a case to justify the expenditure, and you can see where he was going from the full title of the document (my emphasis): "Heads of a Plan for effectually disposing of Convicts, and rendering their Transportation reciprocally beneficial both to themselves and to the State, by the establishment of a Colony in New South Wales". The first point was the effectual disposing of the convicts concerned. Working from Cook and Banks’ accounts he reckoned Botany Bay was "peculiarly adapted to answer the views of government" with a suitable climate, fertile soil, and ready access to wood, water and seafood, and was therefore a suitable site for a settlement. If necessary, livestock could be obtained from the Cape of Good Hope and the Moluccas and according to Nepean they should be self-sufficient in around three years. In any case, in a sort of cost/benefit analysis, bearing the "great object to be obtained by it" in mind, the £4 difference was "too trivial to be a consideration with government", and, in any case Botany Bay was too far away for convicts to return home without permission. There’s a reference to the overcrowded prisons and hulks in the “Heads of a Plan” (fuel for the traditionalist argument) but the key issue in the argument comes with the reciprocally beneficial. In the traditionalist view, the benefit to the State, which would only come at considerable expense, was "he removal of a dreadful banditti from this country." Third, there was “the possibility of procuring from New Zealand any quantity of masts and ship timber, for the use of our fleets in India ... It grows close to the water's edge, is of size and quality superior to any hitherto known, and may be obtained without difficulty." Drafted by Nepean and signed off by Colonial Secretary Lord Sydney, the title "Heads of a Plan" is, in Frost’s reading, a concise enunciation of the key aspects of the proposal, and he points to the existence of a number of other similarly-labelled documents from the period. The traditionalist reading, when it comes to the flax, cotton, spices and timber, is to suggest that they’ve been tacked on at the end and are, therefore, inconsequential window-dressing and to argue conditional verbs ("may not be amiss", "may also be proper to attend") reinforce that conclusion. Frost, on the other hand, finds such terminology in common usage in similarly-labelled documents. Then, given the lack of official references to the use of the settlement as a naval base, the traditionalist reading is to rule it out completely since it wasn’t specifically spelled out, while Frost argues the idea was left out deliberately. You don’t, after all, advertise your intentions when it comes to these matters. There are also interesting references to Arthur Philip’s role in naval intelligence prior to his appointment as Governor. Frost explains that lack of documentary evidence in the form of a written plan or account detailing an intention to expand British interests in the Pacific by suggesting Pitt and his advisers worked it out verbally, and pieces together enough hints and glimpses in the documents he’s uncovered to support the suggestion. Interestingly, Frost claims Pitt himself took personal responsibility for the scheme, and Colonial Secretary Sydney is portrayed as lazy and ineffective. Nepean, according to Frost, did the work and Sydney signed off on it. Frost asserts the First Fleet scheme was well-organised and thought out and that from the earliest stages of the plan, the voyage to Australia was undertaken with the ultimate aim of developing a free settlement. He goes on to point out that the eleven ships chosen for the expedition were all under five years old, in good condition and well fitted out. There also seems to have been a partial selection process and both convicts and Marines were chosen for their knowledge of farming, carpentry, construction, weaving and mining. The Fleet carried two years worth of medicines and surgical items including bed, flour made ‘from good sound corn and calculated to keep for a good eighteen months’, and interestingly, the death rate on the voyage was much lower than expected (around 2%). Things might not have worked out as well as expected, but the convicts were not just dumped ashore and left to starve. To Frost, the convicts were a secondary consideration in a wider strategic plan, there to build the port, dress the flax, fell the timber and work on the plantations. Norfolk Island, offered the prospect of timber and flax and within a week of hoisting the flag at Port Jackson and before he had landed the convicts and unloaded the ships Phillip advised Lieutenant Philip King that he would be taking a specialist party to occupy Norfolk Island and harvest the flax. King sailed a fortnight later. If there’s any single fact that suggests a broader strategic motive for the settlement this is it. Traditionalists may argue the flax industry, if it eventuated at all, would an additional benefit to England but sending a subsidiary expedition to a remote location known to lack a safe anchorage within three weeks of arrival suggests a sense of urgency that can only be explained by an urgent need for the goods the island was expected to provide. Looking at it from this perspective it’s obvious the traditional version of the First Fleet story needs tweaking, at the very least, and the decision that sent those eleven ships on their way was based on far more wide ranging motivations than simply relieving the overcrowding in His Majesty’s prisons. More significantly, once the infant colony found its feet it was, by and large, a self-funding exercise rather than a drain on the Exchequer and a site that could accommodate as many law-breakers as the British authorities needed to expel. Frost’s work should lead to a reassessment of the story, and needs to be followed by further research into the British side of the story using that lode of documentation Frost has managed to unearth. That might, of course, reveal some unwanted truths. Maybe the convicts on the First Fleet weren’t all the harmless petty criminals they’ve been painted to be. Marco Vichi "Death In Sardinia"
Colin Cotterill "Slash and Burn"